The University of Central Florida has concluded its internal review and police investigation of the March 18 shooting incident in Tower 1. Overall, the review determined that UCF “responded commendably” to the March 18 incident by focusing on the safety of the campus and supporting the needs of affected students and staff, as well as sharing timely and accurate information with the broader university family and beyond. Crisis response plans generally worked well and involved personnel addressed real-time and follow-on challenges with noteworthy dedication and outstanding professionalism. This review identifies several areas for improvement, primarily involving the adequacy of certain housing policies, the designation and alignment of assets (staffing and funding) available for support of a prolonged emergency event, and the implementation of enhanced campus security infrastructure (such as universal building access capability, improved security-camera coverage and interoperability, and upgraded emergency messaging systems). Various action items recommend these and other improvements, many of which have already been completed or are in progress, with others undergoing further analysis. The after-action review was a directive from UCF President John C. Hitt in order to record the facts of what took place; evaluate strengths and lessons learned related to university policies, procedures and readiness; and provide recommendations for improving security on campus. The university’s Crisis Management Team met weekly to coordinate the review process, which included contributions from multiple UCF departments, an independent group of university and community members, and an independent security and crisis response expert. To read the summary and the most significant appendices of the after-action review, click here. The university declined to use the subject’s name in the review and police report, except for where it appears in official documents. “The desire for notoriety and attention often fuels these types of acts, and we will not abet creating a ‘celebrity of violence’ around this individual,” said Grant J. Heston, UCF associate vice president for communications and public affairs. The police investigation, which concluded Thursday, showed that two factors likely contributed to preventing the deceased from carrying out his plan of violence against the UCF community. UCF police arrived at Tower 1 within four minutes of the initial 911 call. Material retrieved from the deceased’s computer showed that he anticipated having more time to carry out his plan. Police also found that the deceased’s rifle jammed. “Once the plan was in place, there was no turning back. He knew that he had 10 to 15 minutes that he was going to be able to do harm to our students, but when he didn’t have those 10 or 15 minutes, the plan went awry. With his weapon jammed and law enforcement outside the door, his options were limited. We were incredibly lucky,” said UCF Police Chief Richard Beary. 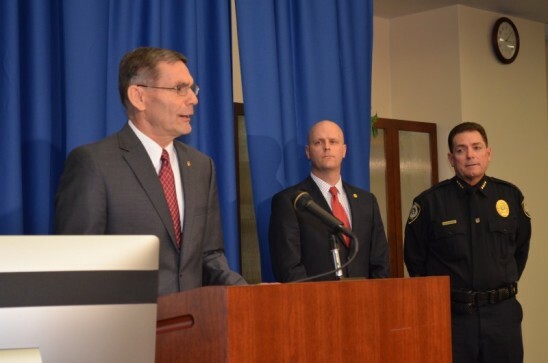 UCF Police worked closely with several law enforcement partners throughout the investigation, including the Orange County Sheriff’s Office; Federal Bureau of Investigation; Florida Department of Law Enforcement; Bureau of Alcohol, Tobacco, Firearms and Explosives; and members of the Joint Terrorism Task Force. Counselors are available to help Tower 1 residents and others who may need assistance. If you would like to speak with a counselor, contact Counseling and Psychological Services at 407-823-2811. Push option number 5 for after-hours assistance. UCF administrators and staff will discuss the incident with university leaders and first responders from all of Florida’s public universities during a two-day crisis management conference in July hosted by UCF.